As noted earlier, the stele is defined as all tissues inside of, but not including, a distinct physiological barrier or boundary layer such as the endodermis (including the conducting tissue), after a concept called the stelar theory, which was initially developed by Van Tieghem and Douliot (1886a, b). The stelar theory is not used today by most botanists working with living plants as it is sometimes difficult to recognize the outer boundary of the stele as originally defined, and because stelar configuration can vary at different developmental stages of the plant or at different levels within a single axis. Nevertheless, the concept has been useful in comparative and phylogenetic studies of fossil vascular plants. In a general sense, stele types become progressively more complex in the fossil record and certain plant groups are characterized by particular types, so a knowledge of stele types is useful in paleobotany. For a treatment of stelar terminology and classification, see Schmid (1982) or Brebner (1902). 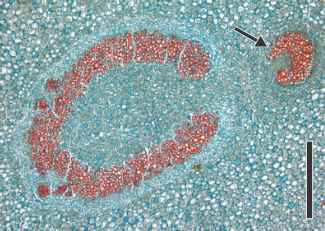 figure 7.32 Cross section of Gleichenia sp. rhizome showing haplostele (Extant). Bar = 650pm. 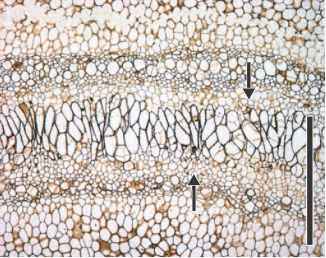 figure 7.33 Cross section of Lycopodium serratum stem showing actinostele with exarch xylem development (Extant). Bar = 200 pm. the furrows. Many roots are simple actinosteles, as they are usually diarch (two arms), triarch, or tetrarch. 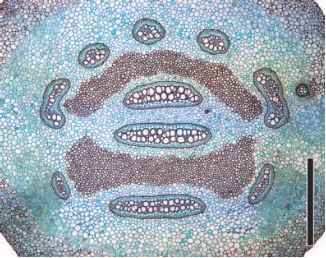 A plectostele exhibits many lobes in cross section, and it may appear as if the xylem is in separate plates (FIG. 7.34); phloem occurs between the plates. A three-dimensional view of a plectostele, however, indicates that the plates are interconnected. Both plectosteles and actinosteles occur in the extant Lycopodiales. figure 7.34 Cross section of Lycopodium sp. stem showing plectostele (Extant). Bar = 300 pm. figure 7.35 Cross section of Helmenthostachys siphonostele showing leaf trace (arrow) (Extant). Bar = 780 pm. ectophloic siphonostele has phloem only on the outside of the xylem. Both ectophloic and amphiphloic siphonosteles are found in the ferns. 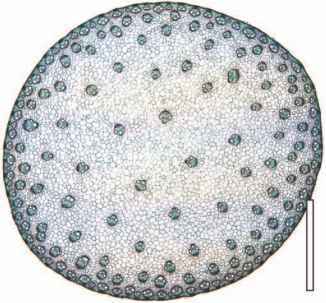 figure 7.36 Cross section of Marsilea quadrifolia rhizome showing amphiphloic siphonostele (Extant). Bar = 300 pm. figure 7.37 Cross section of Psaronius vascular tissue showing preservation of phloem (arrows) (Pennsylvanian). Bar = 1mm. figure 7.38 Cross section of Pteridium aquilinum rhizome showing dictyostele (Extant). Bar = 2 mm. 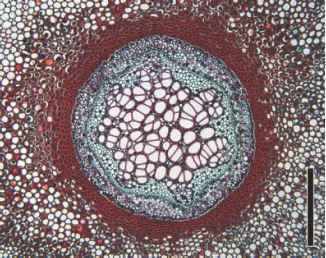 figure 7.39 Cross section of Osmunda sp. rhizome showing dissected stele and leaf traces (arrows) (Extant). Bar = 2 mm. segments. Such a dissected siphonostele is called a dictyostele (FIG. 7.38). Dictyosteles are typical of many extant and fossil ferns (FIG. 7.39). stage between a protostele and a siphonostele, in which the central region contains both tracheids and parenchyma cells. According to this theory, the siphono-stele has evolved by the failure of certain procambial cells to develop into tracheids. Fossil evidence to support this theory can be found within the lycopsids, where protostelic forms occur early in the history of the group, followed by plants with medullated protosteles, and finally by those with siphonosteles (Chapter 9). The second hypothesis on the origin of the siphonostele, often termed the extrastelar theory (FIG. 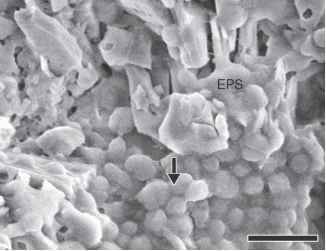 7.41), views the siphonostele as evolving by the continued expansion of cortical parenchyma toward the stem center during the production of leaf traces from the surface of a protostele. In this scenario, cortical parenchyma became "trapped" as the xylem became continuous after trace departure (FIG. 7.41C t . The production of a large number of leaf traces from a protostele would eventually result in a stele in which the center contains parenchymatous pith. Some of the Paleozoic ferns best illustrate this pattern of stelar evolution, for example, the early proto-stelic botryopterid ferns and Grammatopteris, considered to be a progenitor of the osmundaceous ferns (Chapter 11). figure 7.42 Cross section of Zea stem atactostele showing scattered vascular bundles (Extant). Bar = 2 mm. bundle divides in to two, with one part of the bundle separating tangentially to supply the leaf trace and the other part remaining as a sympodial strand (FIG. 7.43C, D) (Namboodiri and Beck, 1968a, b). 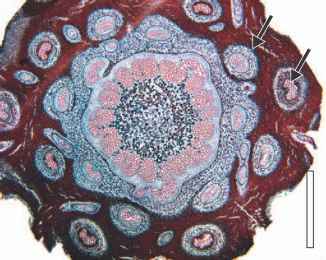 Vascular bundles in seed plants are most commonly collateral, with primary xylem on the inside and primary phloem on the outside. 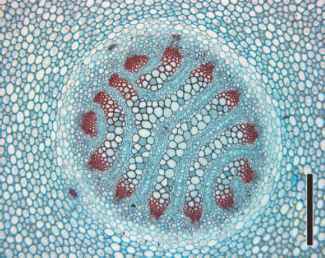 Bicollateral bundles also occur; these have phloem both internal and external to the xylem. change in the production of leaf traces (FIG. 7.43D), so that sympodial bundles divided tangentially to produce traces, is illustrated by several Carboniferous seed ferns, such as Lyginopteris (Chapter 14). Some modern conifers (Chapter 21) have sympodial strands that undulate through the ground tissue. What is a stele in plants? What type of stele found in lycopodium? Which species of lycopodium has plectostele? 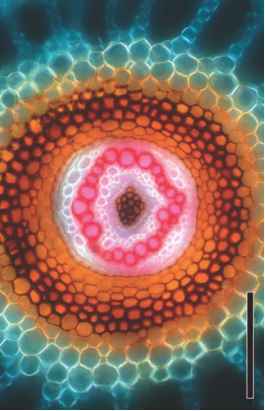 When phloem occurs ouside and inside the xylem the stele is called? How is the eustele produced from the prostele? Which of the has amphipholic siphono stelee? What is the type of stele found in the simplest vascular cryptograms? Which of the fallowing has amphipholic siphono stele? Which type pf stele found in marsilea schizome? What type of stele is found in marsilea rhizome? 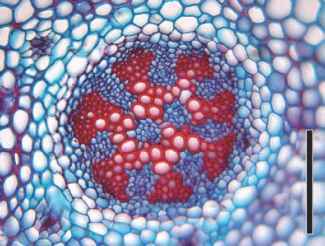 What type of stele is found in marsulea rhizome? What type of stele is found in marsilea rhizome botany? Which type of marsilea stem stele is present? What type of stele is found in Marselia rhizome? Does marsilea rhizone contain amphiphloic siphonostele? Is stele of marsilea rhizome is amphipholic siphonostele? What kinds of stele are found in osmunda? Which of the following has amphipholic siphono stele ans rhizome of marsillea?